on July 19, 2010 at 6:11 pm JasonC. I think it belongs to Vanessa, and I’ll guess atalanta. Vanessa eggs have these flanges on them, and the pictures on the internet seem to match, too. I’m guessing atalant because the spines on the leaf near the egg are small, and I think thistle leaves have a very hairy surface, whereas nettles have smaller hairs. on July 19, 2010 at 7:32 pm JasonC. Hmmm… actually I think thistles have a smooth leaf surface, either way the leaf looks more like that of a nettle than a thistle. Someone beat me to it… but I will run with Vanessa cardui, just for a point of difference (and possible points). 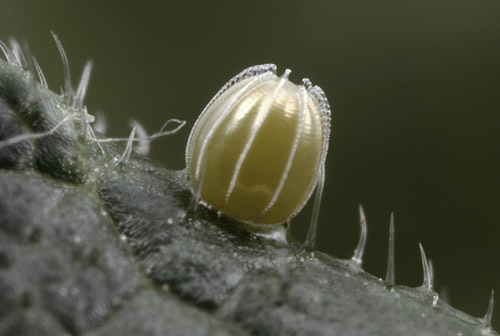 Do I get credit if this is a first attempt, and I spent an hour trying to search butterfly egg pictures on google? Hummm I’ll vote for Polygonia interrogationis… eh but it could also be P. comma. — the critter that produces this must have some rather fancy oviducts! Heh. That caption looks like a bad case of deadline fever.